This is the second of three similar facilities D.F. Chase, Inc. was contracted to build for Embraer. The three Jet Service Centers house Embraer’s new line of executive size jets that came off the assembly in Brazil. 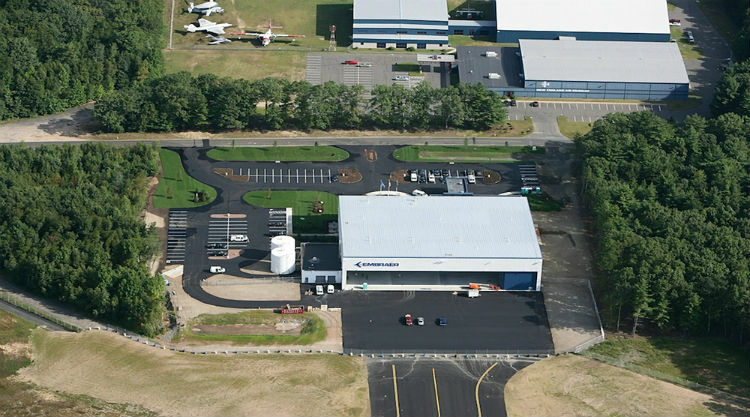 This approximate 50,000 square foot facility includes administrative, shop, service, and hangar bay areas. There is also a meeting area and pilot’s lounge for Embraer’s clients’ use. The building consists of a structural steel frame with a hybrid metal skin system over the frame of the hangar bay. A standing seam roof and a textured masonry system make up the balance of the exterior, the offices, and service facilities. The interior of the structure has a high-end finish look with much attention given to detail and comfort for Embraer clients, guests, and employees.